In a previous blog, we highlighted that carbon-efficient firms tended to be high-quality companies. Moreover, integrated quality + carbon-efficiency hypothetical portfolios tended to have higher risk-adjusted returns and were more carbon efficient than the underlying benchmark. In this blog, we look into the risk and return characteristics of those hypothetical portfolios. This exercise helps us to better understand the sector composition of those integrated portfolios and their return drivers, risk factor exposures, and risk decompositions. The sector compositions of quality + carbon-efficiency portfolios were computed as the monthly average of historic sector weights over the whole back-tested period (see Exhibit 1). We can see that the unconstrained quality + carbon efficiency portfolio has an overweight of 9.77% in Information Technology, an overweight of 8.05% in Consumer Discretionary, and an underweight of 10.24% in Energy in comparison with the underlying benchmark. Sector bets on other sectors are below 5%. 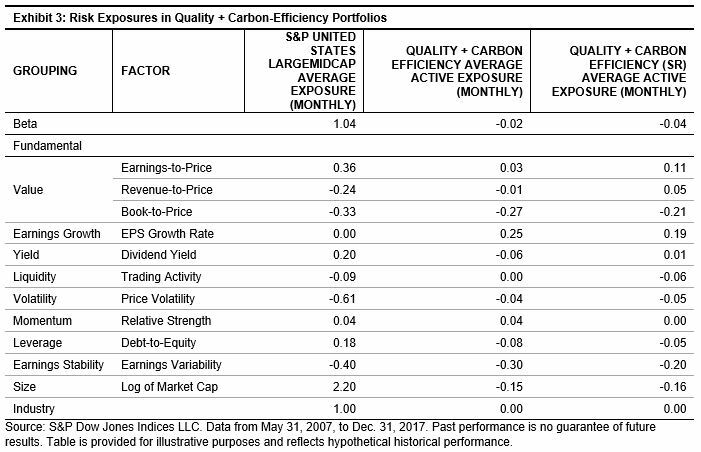 On the other hand, the quality + carbon efficiency (SR) portfolio has sector bets less than 3%. Next, we explore the return drivers behind the sector bets in quality + carbon-efficiency portfolios. Exhibit 2 shows the contribution to returns by sector, calculated as the monthly average of historic sector contributions over the whole back-tested period. 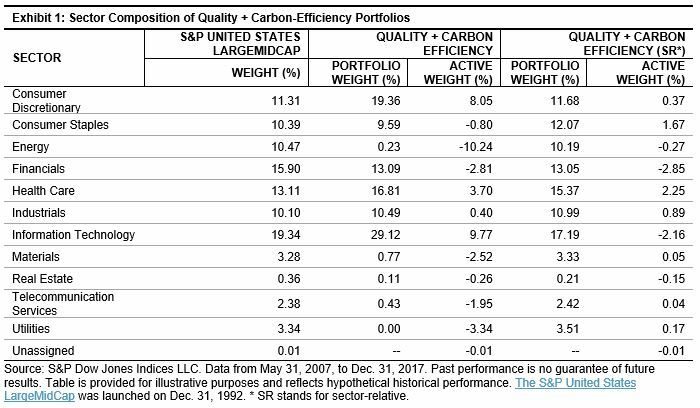 Exhibit 2 demonstrates that larger overweight and underweight in the quality + carbon efficiency portfolio had a positive contribution to active returns, with 1.27% in Information Technology, 0.62% in Consumer Discretionary, and 0.03% in Energy. 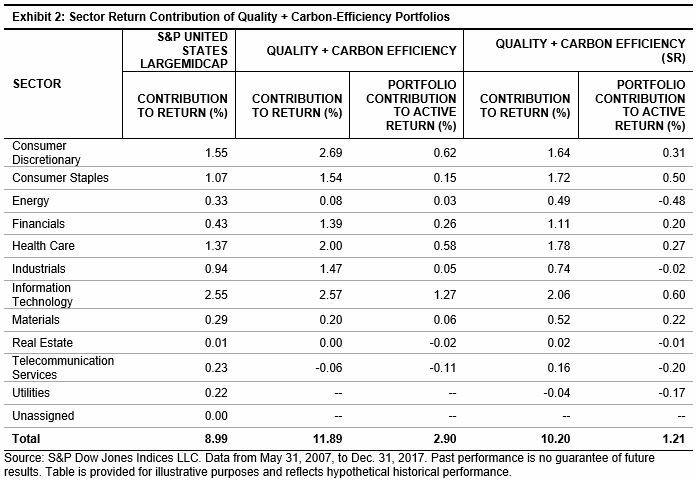 All three active returns were higher than those in the quality + carbon efficiency (SR) portfolio. With respect to active factor bets, compared to the S&P United States LargeMidCap universe, the quality + carbon efficiency portfolios had lower exposures to beta, book-to-price ratio, price volatility, leverage, earning variability, and market cap (see Exhibit 3). On the other hand, quality + carbon efficiency portfolios had higher exposures to earnings-to-price ratio and EPS growth rate. The results from Exhibits 1, 2, and 3 show that quality + carbon-efficiency portfolios have the desirable characteristics of having limited sector bets and positive return contribution. The risk attribution and decomposition figures also show that quality + carbon-efficiency portfolios have higher quality exposures and lower volatility than the underlying universe. Active factor bets are calculated using the commercially available risk model. In this paper, we use the Northfield US Fundamental Risk Model.